Lupita Nyong'o on Sesame Street: The Best Way to Teach a Child the Beauty in Skin! 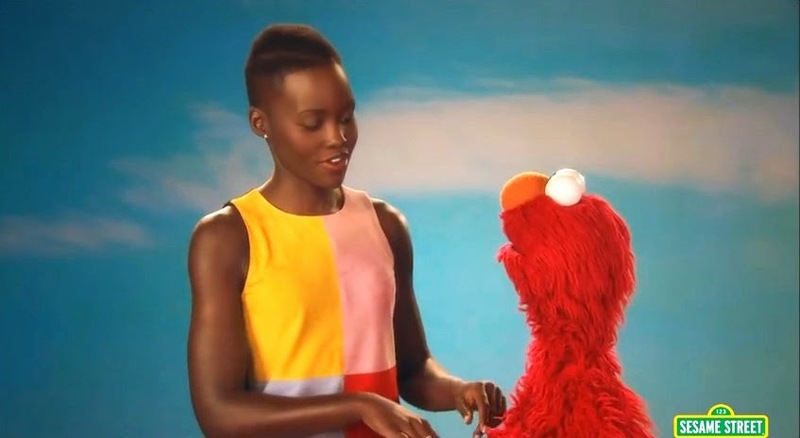 This week on Sesame Street, actress Lupita Nyong'o gave Elmo a lesson about "loving the skin you're in." In a less than 2 minute segment, Nyong'o appeared on camera wearing a pretty multicolored, sleeveless dress. She began by explaining the functions of the skin to Elmo. He then realizes Nyong'o has "beautiful brown skin." Lupita Nyong'o then explains that skin comes in all types of beautiful shades and colors. I love Lupita Nyong'o's way of explaining beauty because it's the perfect message to send to young children. Elmo realizes that he has beautiful red skin. Nyong'o and Elmo ended the segment by stating they both love their own skin. This lesson teaches children their beauty and also shows them the beauty of other races and tones that are different from their own. I think the conversation between Nyong'o and Elmo is the perfect way for a parent to explain the beauty of different skin tones and colors to their children. Go Ms. Nyong'o and Elmo! What did you think of Lupita Nyong'o and Elmo's message?